My daughter has decided that Ian is similar to a doll – she can pick him up, carry him and basically force him to sit with her. After all, the “poor” baby can only crawl, she has the advantage. It is also a benefit to her that he loves to be with her. Every morning, Violet and Ian play together, largely due to the fact that they are the only two in the household that want to wake up at 6 am. This usually happens in one of two places – the living room or on the floor in my bedroom. This morning they happened to be playing in the living room. Things were going along fine. I was in my room getting dressed to bring Violet to school (she wasn’t ready yet – thankfully!) when she came running in screaming that Ian had an “explosive poop” and it “exploded all over her!”. Now, the way she ran in was very comical, mainly due to the fact that Violet HATES to be dirty. She had a big poop spot on the front of her sweatshirt, and her arms were way out to the side to prevent further contamination. As I tried not to laugh, I walked out to get the baby. She was begging for a baby wipe as I was trying to carry Ian over to the couch to check the damage. Lucky for Ian, it seems that most of the poop ended up on Violet, as his pants and shirt were still poop free. How may that be you ask? Well, right before this whole debacle occurred, I had peeked into the living room and saw Violet holding Ian on her lap as he struggled to break free. She must have let him go, only to realize that the struggle had caused the poop to “explode” out the top of his diaper! Thankfully, no one was too upset, and everything was fine within 5 minutes – both Violet and Ian were changed and were “enjoying” breakfast. Ian’s had thrown his on the floor and Violet’s was a whole other story! Did I ever mention that the cats love to drink the milk out of the cereal bowl? How about the fact that they like it the best when they are eating with you? 🙂 Violet, unfortunately, knows this waaaay too well – She spent the 10 minutes prior to leaving the house fighting Romeo off of her Mini-Wheat’s! All in all it was a pretty good morning. I love makeup. Who doesn’t right? Recently, I tried COVERGIRL’s NEW LashBlast Fusion Mascara in Very Black. I have to say, it is by far one of the best mascaras that I have ever used. All it takes is one dip of the wand and you just sweep it on. There is no fussing with either the brush (to clean off excess) or with your lashes after. They just look great and stay that way. The formula doesn’t flake, and when you wash it off, it doesn’t leave the black “smudge” under your eye (come on now, you know what I’m talking about! And it is a terrible thing to try to get off!!). COVERGIRL’s first ever volume + length mascara! -Super-volumizing and Buildable fiber-strength lengthening. -Thickens and extends the look of your natural lashes. All in all, this is a great mascara. I have been using it for about a month and a half, and I am very happy. Some of my close friends and family members have commented on my lashes and said how good they look recently. I have even stopped wearing eyeliner because this makes my lashes look so good that my eyes pop! I am very happy with this product and would recommend it anyone. I have a BRAND NEW full size COVERGIRL LastBlast Fusion in Very Black to giveaway! I love this product and I think you will too! *Follow this blog! Comment that you are following. This giveaway closes at 11:59 pm EST Saturday, October 16, 2010. The winner will be chosen by random.org after OCTOBER 16, 2010! *I was given this product as a free trial/sample by a marketing company, BzzAgent, to try out and provide my honest review/opinion for both them and COVERGIRL. I have not been paid for this review, and it is my own, completely honest opinion of this product. This is my daughters second year in preschool (she is in the “big kid” class this year) and each year they take a field trip to a beautiful Apple Orchard to pick apples. It is a really fun trip, and the kids just have a blast! This year, Violet ate waaaay more apples then she put in her bag, and she climbed up a huge ladder! We took a hay ride and had cider and donuts. It was a wonderful trip, and I had a wonderful time with my little girl! This is the first year that I have gardened, and to my great surprise, my garden was a huge success! I had a ton of fresh herbs left that there is no way I can use before the frost. SO I froze them! There are many different ways to freeze fresh herbs, but this is the way that worked out the best for me. Pick and wash basil leaves. Place in a salad spinner, then blot dry with paper towels. These need to be VERY dry!! Rough chop the leaves and toss with a very small amount of olive oil (the oil prevents them from changing color when you freeze them.) I then measure about 2 – 4 Tablespoons of my chopped basil/oil mixture and I place it in the bottom of a sandwich bag. I roll the bag and place it in a large zip top bag. Repeat with the rest of your mixture until your large zip top bag is full. Squeeze out any extra air and freeze. When you need fresh basil just take out enough baggies to meet your recipe’s requirement. If you are using the basil in a hot dish (like tomato sauce) you do not need to thaw the basil before using it. * If you would like to freeze some basil without the olive oil, you can wash and chop it. Then place it in an ice cube tray with just enough water to cover it. When the cubes freeze, pop them out and place them in a zip top bag. Just make sure to measure how much basil you place into each cube so you can take the right amount out. And same as before, if the basil is being used in a hot recipe, you do not need to thaw the cubes. Pick your parsley (keeping the stems semi-long helps with washing) and wash thoroughly. Dry completely with paper towels (You can roll the parsley in the towels and squeeze to help get all the water out). Rough chop the parsley – I recommend using kitchen shears as this is the easiest way – and discard the stems. Measure your chopped parsley (about 2-4 Tablespoons) and place into a sandwich bag. Roll up sandwich bag and place into zip top bag. Repeat with remaining parsley until the zip top bag is full. Squeeze out any extra air and freeze. When you need fresh parsley just take out enough baggies to meet your recipe’s requirement. If you are using the parsely in a hot dish (like tomato sauce) you do not need to thaw it before using it. Both these freezing methods can be used to a higher scale. Small, freezer safe containers also work for larger amounts. I have used the plastic jelly jars (Ball 82000 8-Ounce Plastic Freezer Storage Containers, 30-Pack) as well as tupperwear containers (Tupperware Freezer Mates Starter Set ). Just make sure when using a container like this that it is FULL when you freeze it to prevent freezer burn. I have done it! I have (finally) found a bottle that Ian will drink!! THANK GOODNESS!!! I bought it last minute at Target on Friday, and figured that I was just (once again) wasting money on yet another bottle he would just bite and throw on the floor. But no, not this time – he liked it! AND he actually drank 3 bottles from it! I know, so exciting!! I worked in a dental office for over 5 years. My mom worked in one for 15, and my Uncle is a dentist. To say that I am obsessed with teeth is a complete and total understatement. So when my daughter, and now my son, reached the teething age I was very excited. Bring on those adorable baby teeth! I was also nervous – I knew that most of the teething gels on the market didn’t work that well because babies have so much drool that the medicine would be washed away before it could really help. My chiropractor at the time recommended that I try an all natural, homeopathic teething tablet made by Hylands. I really admired and trusted my chiropractor and decided to give them a try (hey, she had 3 kids of her own!) and I was so happy! The first thing that I love is that this product really works! Just a few tablets into the babies mouth and that’s it for about 4 hours or more. The tablets dissolve really easy, so there is no chance for them to choke. The relief they bring is almost instant as well. My daughter would give a sigh of relief within 5 minutes of taking them as a baby. The next best thing – they are all natural and homeopathic. There is no “medicine” in them. My daughter was great at getting into everything that she wasn’t supposed to as a baby. One day, she got into the bottle of teething tablets and ate half the bottle! Needless to say, I panicked and called poison control. Their response? They laughed, told me she would be fine because they were all natural (herbs, supplements, etc) and to give her a snack because they might give her a slight stomach ache. Great, my daughter ate a bunch of “medicine” and gets rewarded with a snack! I was so thankful that what she ate wouldn’t cause any damage or need a trip to the hospital. I love the fact that they are so safe! *Hylands has not asked me to review this product, nor have they given me this product to review. 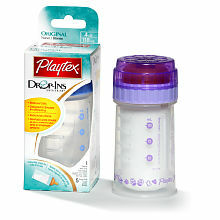 I purchased this product for use with my children, and I am sharing my honest opinion and feelings about it. A few weeks back, I signed up for a promotion that Fisher Price was running for a free TRIO car. My daughter was delighted when it came in the mail today! She was outside when the mail was delivered and could hardly contain herself when she saw that there was a toy in the mail-mans hand. She ran in and asked if I would open in and if she could play with it NOW! I agreed, and was very happy by what came in the package. This kit comes with 6 pieces. The first of which is the base with the four wheels securely attached. There are four spots for the blocks to attach on the base, and let me tell you, once they attach, they are on there. You actually have to make a “snaping” motion to get the blocks apart from one another. Personally, I really like this as it enabled my son to look at the toy too without me being overly worried that he would be able to get the blocks apart and into his mouth. 5 blocks came to build the car. A 3-unit blue one, a 2-unit yellow one, a single red one and an orange and green one that are shaped as a half block with a slant. My daughter quickly built the car that was pictured, drove it around for a minute then took it apart. She spent the next half hour building all types of crazy cars, each one funkier than the next (a turtle ended up “built in” on one of them). She had a blast! An added bonus was that when she was done playing with it, I took the three single blocks off, attached the bigger ones and let my son “vroom” it around the floor for a little while. He was ecstatic! Overall, this toy was a HUGE hit in my house, and my daughter has asked if I will get her more for her birthday next month because she wants to “build a castle” with them! I think that this is a toy I will definately look into purchasing! Thanks for making a great new product line Fisher Price! *Fisher Price did not issue this toy to me to be reviewed, nor was I paid to review it. I received this as a free sample that they were offering on their website. The opinions are all my own and truthful. My son has recently become a very picky eater. He does not want jarred baby food, nor does he want 90% of the baby food made by any baby food company. He only wants to taste some of what we are eating; he usually spits it out and then refuses to try any more. The one thing he will eat, you ask? Cat Food of course!! He makes a mad dash any time he gets a second, and he dashes right for the cat food. It’s a delightful thing to dig cat food pieces out a 10 month olds mouth. Expecially when he is either clamping his mouth or trying to bite me! While I was cooking dinner, Violet decided that I was taking too long to feed Ian and that all his whining was due to the fact that he was unable to wait any longer for dinner. She then took it upon herself to go into the fridge, get out a jar of baby food, open it, get a spoon and napkin, and feed him dinner. 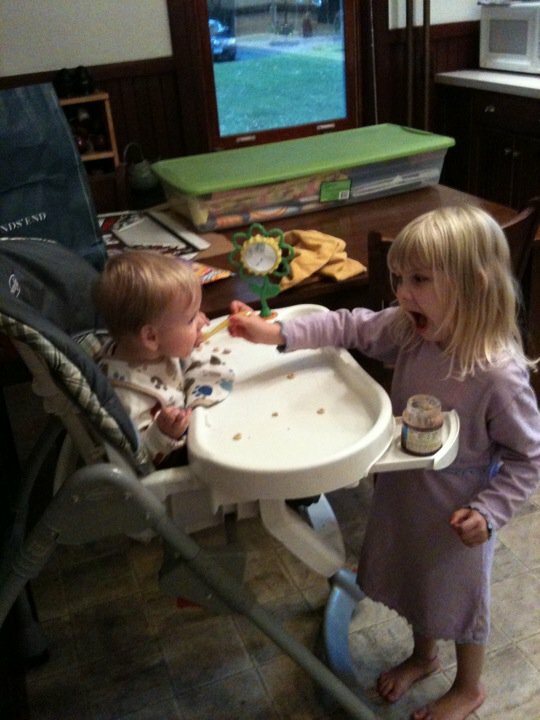 He was SO excited that she was feeding him that he ate almost the whole jar! After getting into trouble the other day, Violet decided to go play outside. She ran into the neighbor out there and promptly informed her that she was “Sick of all the rules” and went about her business of moping about on the swing set. This whole conversation was unknown to me, until the following day when my Mom called me to tell me about it. She knows that neighbor, who happened to tell her what happened because she thought that Violet was just so cute and funny. “Oh Mom! You know! 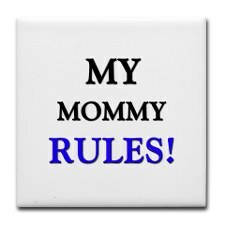 The Mommy Rules!” and went skipping off down the hallway.